7 Millennial Marketing Lessons From Share.Like.Buy. Marketing and research executives gathered last week at the offices of TIME Inc in New York City to learn more about the latest millennial consumer trends that will impact brands in the next 12 to 18 months. Stephanie Sladukus, publisher of People StyleWatch, introduced a new concept called, “webbounding”. Consumers are no longer just “showrooming,” a term used by non-millennials to describe when people shop at a brick-and-mortar store but then go online to find a cheaper price. Research is now showing that millennials often gather information online, check it out at a retail location and then go back online to make the purchase. Jeff Fromm, founder of Share.Like.Buy and co-author of “Marketing to Millennials: Reach The Largest & Most Influential Generation of Consumers Ever,” views this new behavior as an example of a core millennial trend that he describes as Useful Is The New Cool®. Millennials only want products that are useful and can benefit them in some way. They are not willing to spend money on things that are gimmicky or “techy” simply for the sake of being “techy.” If it’s useful, they want it. GEMS, an acronym for Girls Engaged in Massive Spending, is what women become when they get engaged, move in, get married or have babies, said Carrie Reynolds of XO Group, the company behind media outlets, including The Knot, The Next and The Bump. 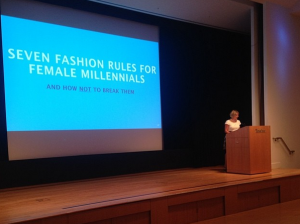 Her presentation was based on a national study of 5,000 Millennials, including 2,000 GEMS. She explained that GEMS are hardworking, budget-conscious, optimists who will spend more money on big-ticket items, such a couches or chandeliers, as a way to invest in their adulthood. They are also willing to spend a significant amount of money on their weddings and aren’t just spending daddy’s money. As a result of the decision many millennials are making to get married later in life, most of these young women have the means to pay for some, if not all of their dream wedding. Sarah Power, chief strategy officer of Initiative Media, talked about increased consumer cynicism, saying that 30 percent of millennials are untrusting of how most brands market to them. In fact, one in five people between the ages of 25 and 34 cannot even articulate a favorite brand. In order for brands to get past this hurdle they must do the following: adapt, collaborate and increase creativity. Adaptation: The ability to adapt is an indispensable life skill and the filter through which millennials see the world. Collaboration: The way millennials use technology foreshadows how marketing should evolve, Power said. 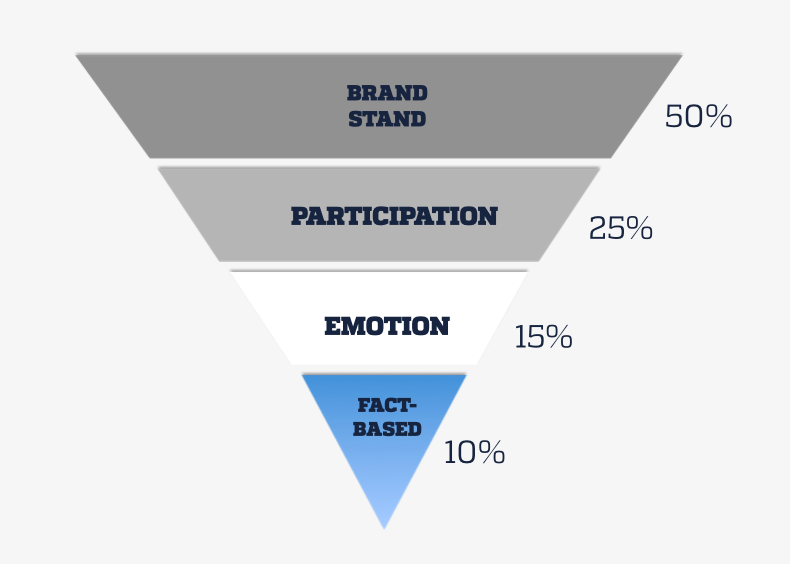 Brands must interact with consumers and allow them to be a part of the marketing process. Creativity: Millennials will judge brands the way they, as a generation, have been judged – based on their creativity. Essentially, brands that are innovative and willing to take risks will win. “It’s basically be creative or be ignored,” Powers said. Millennials, however, understand that it is difficult for brands to break through the clutter, so they are willing to reward brands with their loyalty for even small innovations. FutureCast executive Greg Vodicka talked about the critical need to engage both employees and consumers by standing for more than your bottom line. In the millennial inspired “Participation Economy,” consumers are demanding more from the brands they consume. More than a function or even a differentiated model, consumers want to know your organizations purpose and corporate mission. Millennials gravitate to those organizations that stand for more than their bottom line and exist for a higher purpose. For today’s “modern brands” the goal is not to do business with people who want what you have, but rather to do business with people who believe what you believe. Millennials have a certain expectation around this, and they’d rather purchase a product when they know their dollar is going to something meaningful. 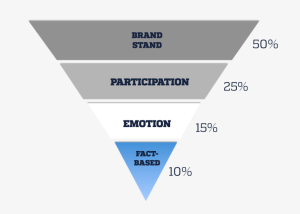 In the past, marketers used to position brands around facts and function. Some inspired organizations put a larger emphasis on the emotion tied to function. Today, your brand purpose must be at the heart and sole of your positioning, followed by incorporating a healthy amount of participation along with function and emotional benefits. Millennials listen to music more than they watch TV, read, peruse the Internet or play games on their devices, said Elliot Lum, VP of Strategic Marketing for Columbia Records. Because millennials are so passionate about their beats, brands can win by using music and artists to their advantage. For example, musical duo MKTO (who performed at Share.Like.Buy.) recently partnered with Vans, a shoe brand targeting millennials. “The key,” Lum said, “is to build partnerships with artists who reflect the brand, but who are also authentic, fun and can relate well to the audience.” For example, consumers can tell the difference between a singer feeding his own Twitter page versus a PR firm sending out tweets on his behalf. Few things are more satisfying to a millennial shopper than finding the perfect outfit at a great price, said Sara Buck of Barkley. Millennial women who are “incentivized and rewarded” are three times more likely to follow a brand, seven times more likely to share their experience on Twitter and six times more likely to upload photos of the items on Instagram. Millennials also want “elite” status and are more likely to participate with brands that tailor messages and deals to fit their specific desires, Buck said. They are receptive to marketing tactics, such as emails and texts, if they deem it worth their time. Spamming is not a problem for Millennials if they see a benefit to trading their information. Retailers who provide exclusivity and reward loyalty will win with Millennials. 7. The next generation identified? Always looking to be on the cusp of new marketing trends, Share.Like.Buy. ended the day with a discussion abut the generation following millennials, which includes anyone under 20. According to The Sound’s Kelli Johnson, VP & Research Director, and Caroline Fletcher, Research Director, this new generation, mainly raised by disillusioned Generation X, are already more serious, thoughtful and careful when it comes to life choices. Kelli and Caroline, who have been studying this generation, discussed how they differ from millennials, who despite the state of the world as they came of age, enjoyed formative years filled with prosperity, optimism and teacup parenting. In stark contrast is the next generation, which has been marked with the recession, war and chaos. These kids are realists not idealists and will be competitive opposed to millennials, who are very collaborative in nature. Understanding what differentiates them from the millennials will be essential to marketers, strategists and researchers targeting the youth market, Johnson said. For example, both groups see owning their own business as the way to prosperity, but for different reasons. Millennials were taught to feel special and capable of anything by their Baby Boomer parents. Meanwhile, the younger generation feels like if they don’t start their own businesses, they may not have a job. Before joining Barkley this year, Cherryh spent her career as a journalist writing for a variety of publications, including American Fitness magazine, The Kansas City Star and FastCasual.com. Her 4-year-old son makes her a "Millennial...See Cherryh's full bio.